Operatives of the Lagos State Police Command have arrested one Wasiu Oyewole for conniving with two others to scoop fuel after allegedly vandalising a Nigerian National Petroleum Corporation’s NNPC pipeline in the Owutu area of Agric, Ikorodu. The Police Public Relations Officer, Bala Elkana, said in a statement on Sunday that Oyewole and his accomplices, who are still at large, were intercepted by the anti-crime operatives of the command at the Canoe area of Ejigbo, on Thursday, March 28, 2019. Elkana stated that the suspects took to their heels when they spotted the policemen on patrol, adding that Oyewole was arrested after the cops gave them a hot chase. 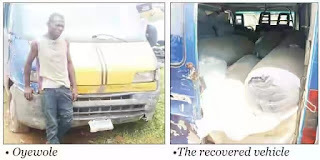 He said, “On Thursday, March 28, 2019, around 12.30pm, while on anti-crime monitoring of the Canoe area of Ejigbo, the police operatives, led by Sergeant Sunday Joseph, suspected a Fiat bus with two contrasting colours, the Lagos commercial colour at the front, while the rest is painted in blue. On sighting the policemen, the three occupants of the bus jumped down and fled in different directions. “The policemen pursued them and caught up with one of them, Wasiu Oyewole, of No 3 Oluseyi Street, Agodo Egbe, Lagos, while the remaining two jumped into the canal and escaped. The suspect confessed that he and his cohorts loaded the bus, with number plate LND 825 BC, with multiple sacks laden with PMS or petrol.